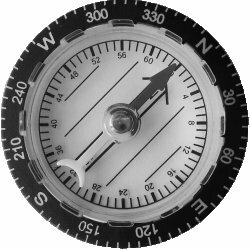 Cheap, basic compasses may be marked with the cardinal points of North, East, West, and South with the intercardinal points of North East, South East, South West, and North West between them. These compasses just provide your general direction when accuracy is not necessary. See Compass Reading for more info. A compass divided into 360 degrees is the most common unit of measurement. Each degree is divided into 60 minutes, each minute into 60 seconds. A handheld compass is not able to measure down to a minute, let alone a second, but those units are used for precise locations using latitude and longitude. North is at 0 degrees (and 360 degrees), East is 90 degrees, South is 180 degrees, and West is 270 degrees. Some compasses may be marked in degrees only from 0 to 90. See this example. It has 0 to 90 degrees from North to East. It also has 0 to 90 degrees from South to East, Sout to West, and North to West. 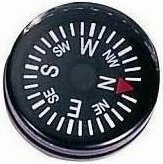 With this style of compass, readings such as North 20 degrees East are used. That means 20 degrees towards East from North. A bearing of South 70 degrees West would be the same as 250 degrees on a normal 360 degree compass (180 degrees for South plus 70 degrees). A bearing of South 15 degrees East would be the same as 165 degrees (180 degrees minus 15 degrees). Another unit of measure, the radian, is used mainly by militaries in artillery, tank, and mortar gunnery. Compass use of mils typically rounds 6283 to 6400 for simplification. Some foreign militaries have simplified the other direction and divided the compass face into 6000 units, exactly like the face of a watch, with 100 units the same angle as a minute on the watch face. Conversely, if you know the size of an object, you can estimate its distance from you. If the tops of two mountains are 1 mile apart on your map, but they appear to be 100 mils apart, you must be 10 miles away. The grad is a metric unit of measure, not commonly used. There are 400 grads in a circle where 100 grads = 90 degrees. Each grad can be divided into 100 centigrads (c). Each centigrad can be divided into 100 centi-centigrads (cc). Where is it always 90 degrees, but never hot? At the North and South poles. My compass has grads round the dial - no wonder it was dirt cheap. Other than this it works really well and has useful luminous markers on the N needle the direction arrow and the backplate. Maybe I will look for a new one with degrees on, but for now I am ok with mine. Excellent this possibility to have a better look on the model! Worked well ! Interesting article, thanks for the ibformation. However, your W=RM rule about distances between objects is incorrect. The width of an object is equal to the Range expressed in thousandths multiplied by the mils wide it is. By this algebraic formula, we can see that the distance between two objects or the size of a single object is equal to the mils wide it is multiplied by the range to target expressed in thousandths. This will only give you meters though, as 1 meter equals 1 mil at 1000 meters range. Ok so if 1 mil = 1meter at 1000 meters what is one mil at 2000 meters and what is the equation for that? @Eduardo - Since it is twice as far away, it is twice the size = 2 meters. Cody - I think you'll find that the mil scale is unit independent, as the article states. Hence 1 metre equals 1 mil at 1000 metres: and 1 foot equals 1 mil at 1000 feet: 1 mile equals 1 mil at 1000 miles: 1 mm equals 1 mil at 1000 mm: 1 rod equals 1 mil at 1000 rods: etc etc etc. Good article my friend. I had no idea radians / mils were used on compasses. Imagine my embarrassment when, after 53 years on ships, I was asked by a friend why her compass was divided from 0 to 64 and I didn't know! We used the cardinal system on magnetic down to quarter points when I started at sea. These worked out at about every 3 degrees - which was good enough back in the day. You worked from the 8 major points - starting from N this would be: N; NE; E; SE etc etc. Using quarter points would be N; N 1/4 E; N 1/2 E; N 3/4 E; N x (say 'bi') E; N x E 1/4 E; N x E 1/2 E; N x E 3/4 E; NNE. Now you came up the other way from the NE and not the N: We were at NNE so next is NE x N 3/4 N; NE x N 1/2 N; NE x N 1/4 N; NE x N; NE 3/4 N; NE 1/2 N etc etc you get the idea (I hope!) Steering a sailing ship to 3 degrees was good enough - when you were out in a gale and full of grog. If you get the hang of it you will have more compass knowledge than 99% of seamen out there today! !